Each Eagles game will be previewed here with this preview serving as the game thread. Included will be scoring updates and stat summaries following each quarter and at the end of the game. We've also provided links to the official Twitter accounts of both team in each match-up. Often those accounts will have additional updates leading up to, during, and after the games. All times are Pacific Time (PST). Times and broadcast information could be subject to change. What: The Black Bears make the trek across the country to face the Eagles. When: Saturday, December 15 at 11 a.m.
EWU Radio Stream: 700 ESPN. 2018 Records: Black Bears 10-3 (7-1 Colonial Athletic Association); Eagles 11-2 (7-1 Big Sky Conference). Head Coaches (overall as HC): Black Bears - Joe Harasumiak (20-14); Eagles - Aaron Best (16-6). Last Week (Quarterfinals): Black Bears def. Weber St., 23-18. Eagles def. UC Davis, 34-29. Black Bears Notes: The Black Bears are in an unfamiliar position; this is the first time they've advanced to the FCS Seminfinals. They reached the quarterfinals in 2001, 2002 and 2011, only to be turned back each time. They have returned to the playoffs after a four-year drought. For the second time in two weeks, their playoff run takes them to the West Coast, having stunned Weber St., 23-18 in the Quarterfinals last week. With a win in this game, they would reach their first-ever Championship Game. The Black Bears' only bowl appearance came in a 31-0 loss to East Carolina in the Tangerine Bowl in 1965. Chris Ferguson lines up under center and has completed 57 percent of his passes for 2,047 yards with 21 touchdowns against nine interceptions. Ramon Jefferson is as solid as they come, having gained 1,031 yards on 171 carries with 8 touchdowns. Joe Fitzpatrick comes in with 113 rushes for 475 yards with 3 touchdowns. Earnest Edwards has 49 catches for 793 yards and 10 scores. Jaquan Blair has added 38 grabs for 501 yards and five scores, while Micah Wright has 44 grabs for 495 yards and six touchdowns. Eagles Notes: The Eagles return to the Semifinals for the first time since 2016. They are looking to return to the National Championship Game for the first time since they defeated Delaware, 20-19, to win the title in 2010. Current head coach Aaron Best, an EWU alum, was the offensive coordinator for that team. Undoubtedly, he would like to lead these 2018 Eagles to a title of their own. The Eagles struggled last week in their quarterfinal game against Big Sky rival UC Davis, but rallied with 20 points in the fourth quarter to advance to the Semis. Eric Barriere comes in completing 61 percent of his passes for 1,900 yards with 17 touchdowns and a half-dozen picks. Impressive numbers given Barriere has started in just eight of the Eagles' 13 games this season. He also has rushed for 550 yards and seven scores. Sam McPherson leads the ground attack with 174 rushes for 1,288 yards and 12 touchdowns. Nsimba Webster has topped the 1,000 yard receiving mark with 1,099 yards on 71 catches with seven touchdowns. Andrew Boston and Henderson Belk have each caught three touchdown passes on the season. 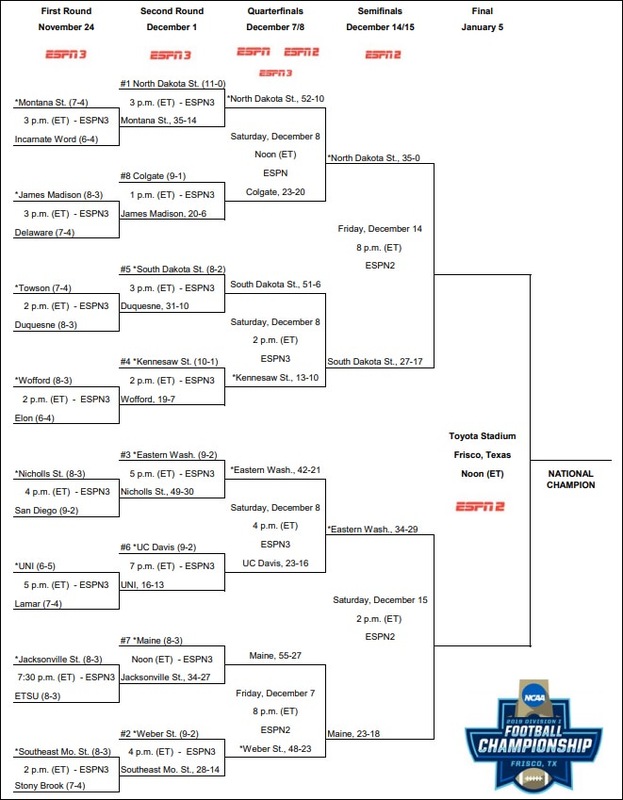 Additional Notes: The winner of this game will face the winner of the other Semifinals game which has South Dakota St. making a short trip north to battle North Dakota St. Once the finals match up is set, the teams will have three weeks until the National Championship Game. That is scheduled for January 5 at Toyota Stadium in Frisco, Texas. South Dakota St. is a member of the Missouri Valley Conference. Top-ranked North Dakota St., is leaving the Big Sky Conference to join the Missouri Valley Conference. While not officially a member of the Big Sky, it played a Big Sky schedule this season. 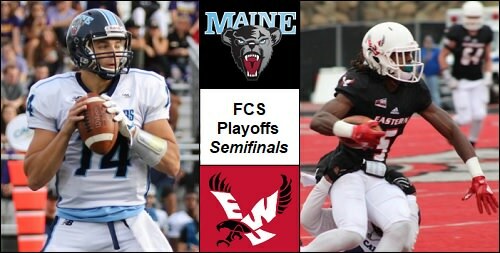 Photo Credits: Above left: Black Bears QB Chris Ferguson (photo via Uinversity of Maine Athletic Department). Above right: Eagles WR Nsimba Wesbster (photo by Richard Clark IV/The Easterner).